Born and raised in Ireland, James travelled to his first festival at the age of four with his family of nine in an old Morris Minor, leaving him with a love of festivals and a dislike of car travel. He joined Festivals Edinburgh as Head of Marketing and Innovation following senior management roles with a number of organisations including Salisbury International Arts Festival, the Royal Liverpool Philharmonic Society and Arts Council England where he had lead responsibility for regional funding programmes of £25m. His interest in festivals as a key element of the cultural infrastructure has led him to develop various festival policy contexts and international festival partnerships including the European Festival Research Programme. In his current role with Festivals Edinburgh, a uniquely collaborative organisation, he works to sustain and develop the position of Edinburgh as the world’s leading festival city—which now sees the Festivals host each year, over 25,000 world class artists, more than 2000 accredited media and audiences of 4m+ while generating £260 million (€305m) for the Scottish economy. 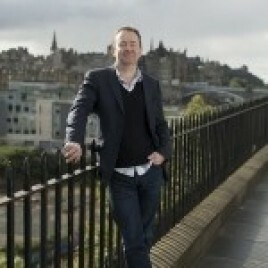 James is also a Trustee of the Edinburgh UNESCO City of Literature Trust and sits on the board of New Media Scotland.